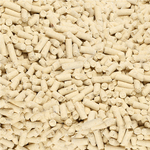 Laboratory testing has shown that this award winning clumping corn litter absorbs 4 times its own weight in liquid; thats 6 times more than Paper & Crystal Litters; 3 times more liquid than Wood litter and 1.5 times more than non pelleted Corn litter. 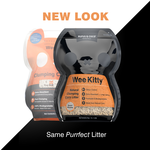 Soiled litter forms clumps for easy removal and are flushable in small quantities. This litter is also biodegradable making it suitable for mulching or composting after use. Founded in 2008, Rufus & Coco is wholly Australian owned and the fastest growing pet brand in Australia. Rufus & Coco are committed to producing high quality pet products that are ethically sourced and use natural alternatives wherever possible. 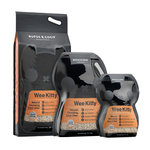 Their range of pet products and accessories are developed in consultation with world leading formulators, manufacturers and developers to ensure that they are of the highest standard. Prefer a crystal litter? Try Catsan Cat Litter Crystals. Need to stock up on litter tray liners too? 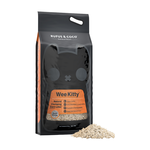 Check out Rufus & Coco Elasticised Litter Tray Liners. 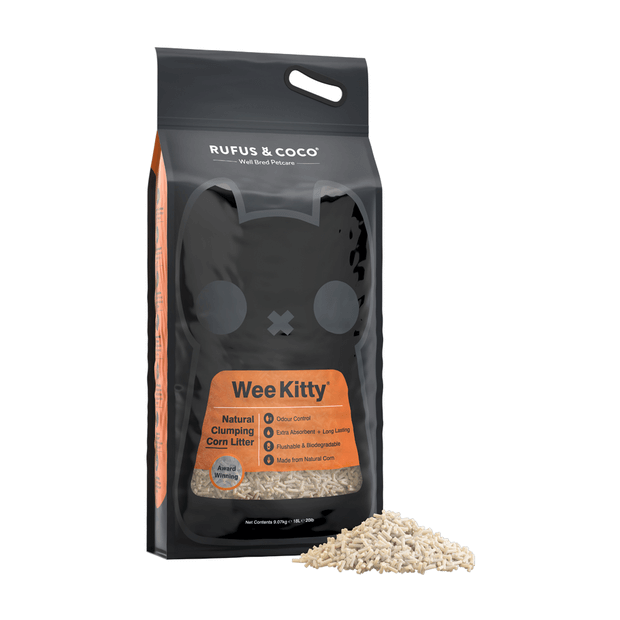 Wee Kitty is made from corn and natural plant fibres, combined with a binding agent and fragrance. It is a safe, natural based product. Wee Kitty does NOT contain bentonite clay. We love the fact that this litter does actually clump. Much easier to remove waste. We have a ragdoll cat so far less sticks to his fluffy feet to come with him out of the litter tray. You do need to do a complete change once a month to avoid the urine odour. Not sure if 9 kgs lasts 18 weeks though. More expensive but we waste far less than the paper litter which we loved too. The best litter I’ve ever used by far.